Separate dough into 8 triangles. Place triangles in ungreased 12-inch pizza pan or 13x9-inch pan; press over bottom and 1/2 inch up sides to form crust. Seal perforations. Beat eggs, Italian seasoning and salt with fork or wire whisk; pour into dough-lined pan. 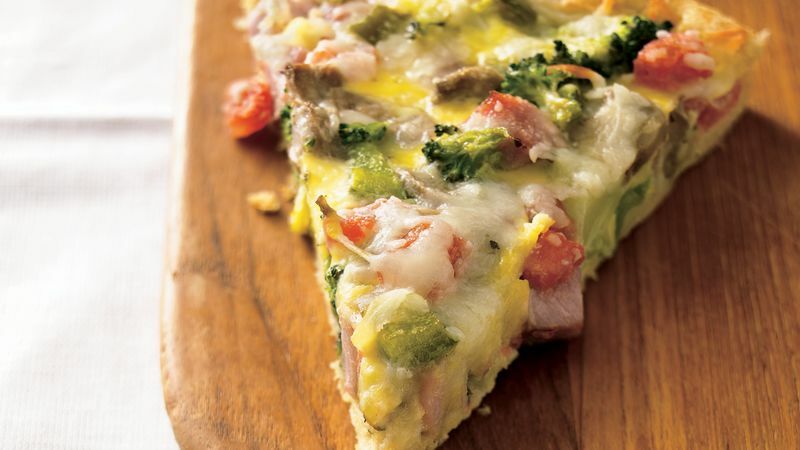 Top with ham, mozzarella cheese, broccoli, mushrooms, bell pepper and tomato; sprinkle with Parmesan cheese. Bake 30 to 40 minutes or until eggs are set and crust is golden brown. To seed a tomato, cut the tomato crosswise in half and squeeze each half gently over a bowl to remove the seeds. Add a little kick, and use shredded pepper Jack cheese instead of the mozzarella.